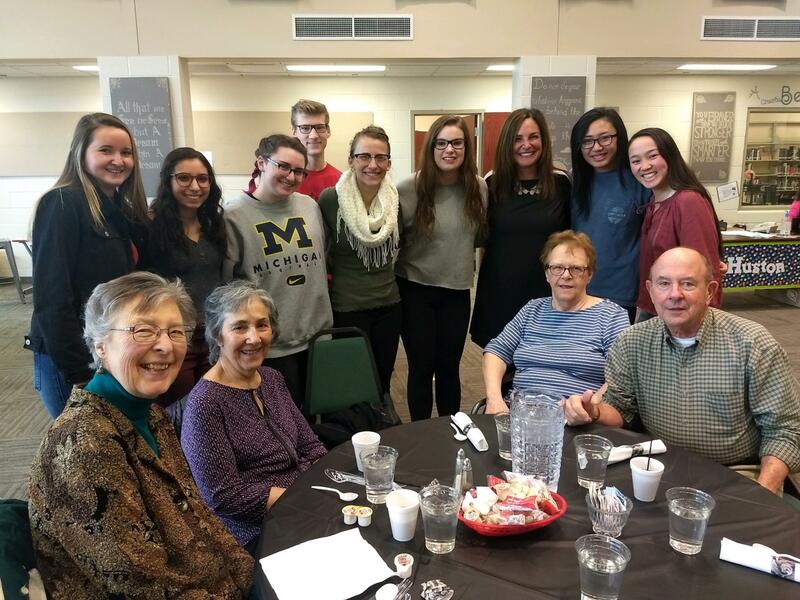 More than 50 senior citizens from the Brecksville and Broadview Heights community converged on the High School earlier this week to enjoy lunch and a preview presentation of the Theater Department’s Spring Musical: Mama Mia. First meeting in the High School Media Center, senior citizens were given the opportunity to participate in a scrumptious lunch courtesy of the food services team and served by senior members of the National Honor Society. Superintendent Joelle Magyar and High School Principal Steve Ast opened the luncheon with remarks and the student servers from the National Honor Society introduced themselves and shared their future college plans with the recipients. After a lite lunch, the group of seniors were then escorted through the Hall School halls and to the auditorium where they watched a preview dress rehearsal of Mama Mia which is this year’s Spring Musical. The BBHCSD enjoys the relationship it has with its senior citizen partners, thanks them for visiting the school and invites them back anytime. Go Bees!